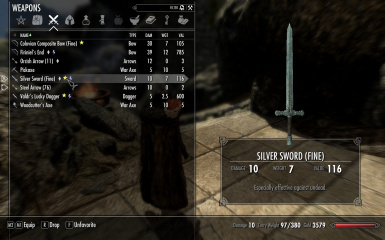 After installing Eze's Artifact Disenchanting mod you'll likely find all silver weapons are priced suddenly at 8k. Not sure why that is - probably a box he overlooked. This fixes it reverting pricing back to vanilla, just put it below his mod in load order. Please endorse if you find useful, always happy to get endorsements. Please Note I have just come back after 4 months away from Skyrim, and found Eze updated his mod, however didn't fix the issue. (I have issued stern mails about this fact). As a result and the fact that he's never replied to me in the past, I've updated it for the new 5.5 version of his mod. Enjoy.